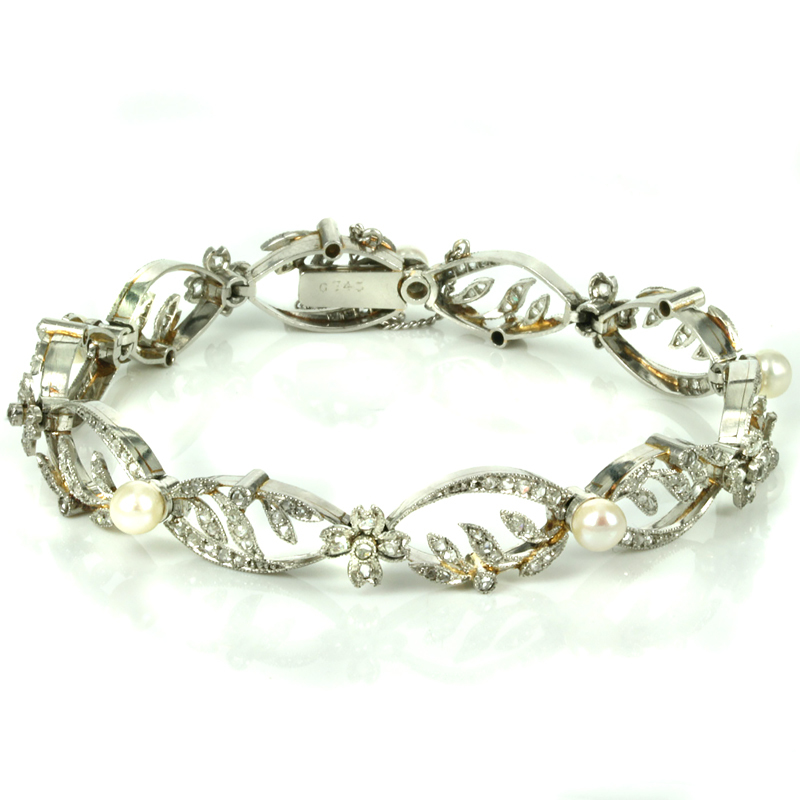 Product code: ES3672 Categories: Antique, Antique Bracelet. Here is an extraordinarily beautiful and elegant antique diamond and pearl bracelet dating from the Belle Époque period of the early 1900’s. This was a wonderful era post Victorian and coming into the Art Deco period and is characterised by feminine flowing lines with the use of platinum and gold and diamonds as well as other precious gemstones. Made in 18ct yellow gold and platinum, the bracelet is designed in such an elegant flowing design set with diamonds and pearls as well as clusters of diamonds. In total there are 95 rose cut diamonds and 5 pearls, with the diamonds totalling 0.86 carats. From end to end the bracelet measures 18.5cm in length and is fitted with a tongue clasp with a safety chain for added security. At the widest parts on the bracelet, this distance measures 9.6mm wide and sits so well on the wrist. This is one of the most elegant and divine antique diamond and pearl bracelets made even more charming and wonderful by the use of gold and platinum with the sparkle of diamonds and the addition of lovely white pearls.